The top news for the weekend is some of the biggest news of the season, as we called it, with Captaintreacherous winning the $1-million Pepsi North America Cup. We call your attention to a blog I wrote for the standardbred industry two days before the “Cup,” which is everything I have to offer about this great colt. Click here to read. Aside from the accolades, we told you that at 1-1 or up Captaintreacherous would be an overlay. He paid a remarkable $4.80 to win. The buzz horses were all zapped by the stretch to the point where the longest shot on the board—Twilight Bonfire—who got into the race on the random draw, closed on the inside to be second at 96-1. He paid $44 to place and ignited a $213 exacta. We cannot take any credit for that exacta. In fact, our best second choice, Odds On Equuleus, raced badly. Trainer Tony Alagna’s other entry, Wake Up Peter, got up for third. In the filly version, we missed the triple by one position but gave you the $20.10 exacta as I Luv The Nitelife blew the field away in the stretch to win and pay $3.20. Belle Boyd was second in that combo. We lost the Armbro Flight to the favorite, Maven ($2.80) with our 22-1 shot that finished seventh. One of our two selections in the Mohawk Gold Cup won; second choice Warrawee Needy paid $7.10 while first choice Fred And Ginger suffered a bad journey as the favorite and finished sixth. The night before the Cup we could only hit with a strong choice at the Meadows, as Lonewolf Currier paid $2.80. Dolly Howard finished behind Purple N Gold at Running Aces for an exacta worth $278.80. Only 22 horses went to post. The Hambletonian will remain at the Meadowlands through 2018 and hopefully TwinSpires will be able to report on it and all of the orbiting stakes live, as well as all the races leading to the classic trot. The Hambletonian Society, the race sponsors, and the Meadowlands have extended the existing contract three years. The Meadowlands has hosted the event since 1981. The $1.2 million renewal takes place on Aug. 3. The Hambletonian, first contested in 1926, was presented at five different tracks, including a 25-year run, until 1980, at the harness meet in DuQuoin, Illinois. Here is a driver’s update. At Vernon Downs, on June 13, driver Roman Lopez became the first driver to post five wins on a single card at the 22-program meeting. The track was sloppy and the 53-year-old horseman managed to bring home enough winners for a flat-bet profit of $22.70 (it cost $20 to play each horse he drove on the program and the total return on five winners was $42.70). Lopez lost five drives on the same program. I was not only lucky enough to have witness the great trotting mare Peace Corps race, I was fortunate enough to meet her in her stall when former owner Hans Enggren housed her at Kosmos Breeding Farm in Pennsylvania. Recently, it was confirmed that Peace Corps died in Mallorca, Spain, last November at the age of 26. Her current owner, John Bootsman, confirmed the mare’s demise. He said she had a “good life” on the island in the Iberian Peninsula. Peace Corps (pictured left) was a five-time (1988-1992) divisional trotting champion, who earned $4,137,737. She raced from 1988 to 1994, and was the top money winning female standardbred in the world. 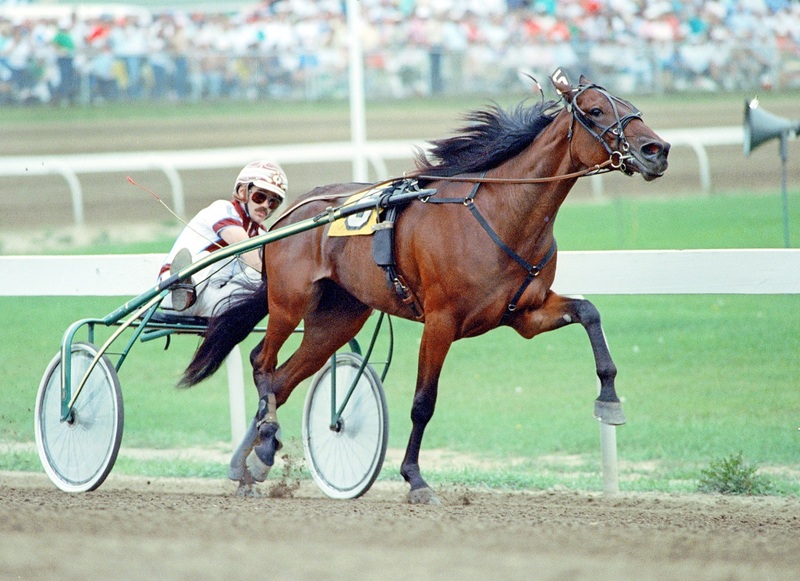 Early in her career, she was trained by Tom Haughton and started in the 1989 Hambletonian, which was won in a dead heat by Park Avenue Joe and Probe. Peace Corps was third. 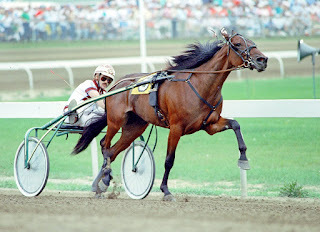 Peace Corps also won the Breeders Crown four times, in 1988, 1989 and as a mare in 1990 and 1992. The undefeated Wheeling N Dealin, a top Hambo contender got onto the track for the first time since winning the Breeders Crown last October. Wheeling N Dealin won his qualifier at Mohawk in 1:55.3. Trainer Dustin Jones said last week that the colt will qualify at least once more and then try and get a few overnight races before the Hambletonian. Also qualifying on June 12 was last year’s North America Cup winner Thinking Out Loud and his talented stablemate Dapper Dude, as well as Little Brown Jug winner Michaels Power. Thinking Out Loud won his qualifier in his first appearance since December. His stablemate from the Bob McIntosh stable, Dapper Dude, finished second to Michaels Power in a qualifier won in 1:52.3. For Michaels Power it was the second winning qualifier of the 2013 season.